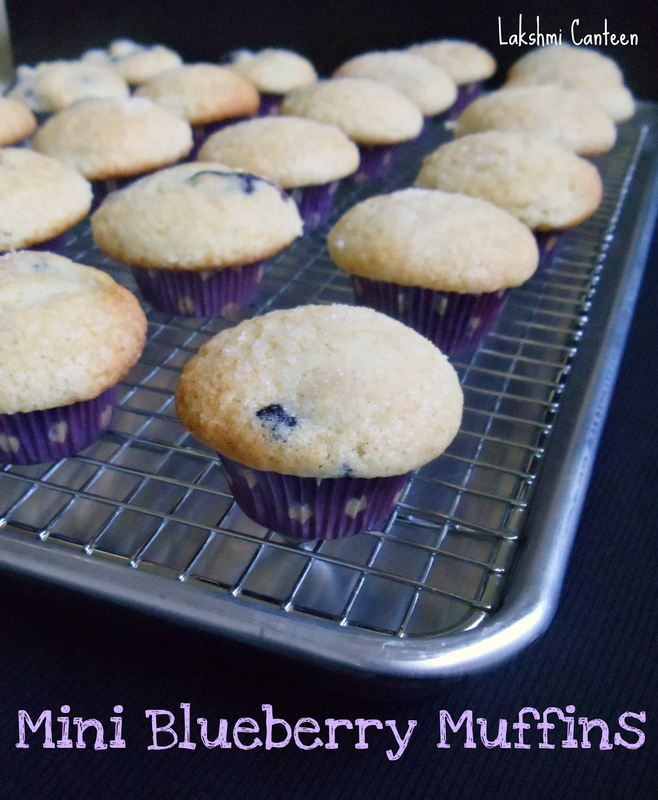 Blueberry Muffins are one of the most popular muffins in the US. I enjoy eating muffins. I bake it once in a while to pamper myself. My husband hates any kind of berry..be it strawberry, blueberry etc. So we never buy berries. 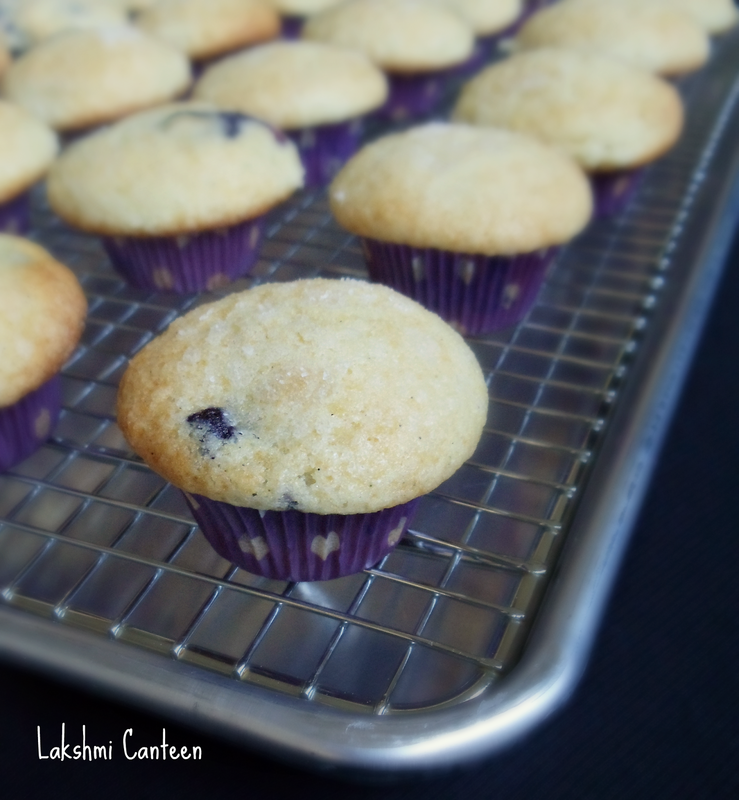 But few months back I felt like baking blueberry muffins and hence got blueberries. I decided to give this recipe a try. The muffins turned out very delicious. It was very moist with a crunchy top and not too sweet. The oil added keeps the muffins moist. 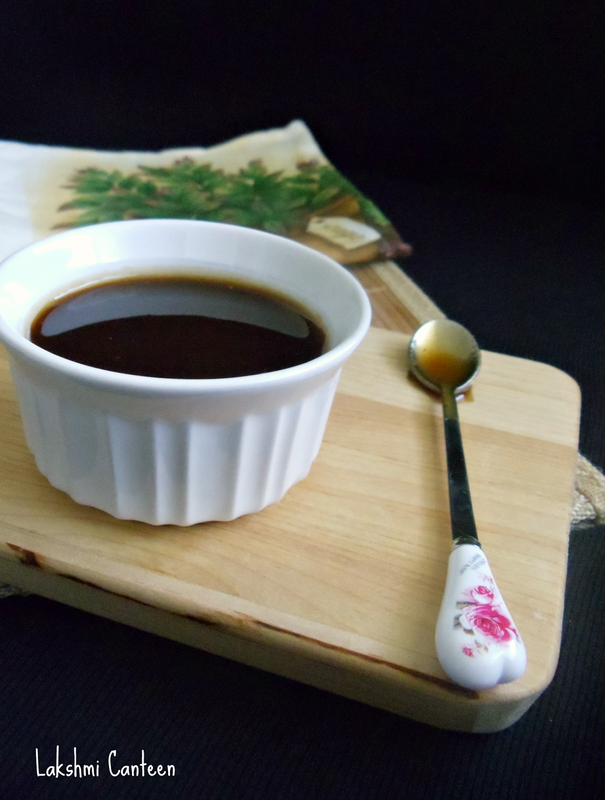 I also decided to add vanilla bean paste instead of the extract and it did add a lot of flavor. Overall one of the best muffins I ever baked. I shared most of the muffins with my friend. She was very happy the way they turned out. I decided to make the mini muffins as they look very cute and a very good size too. 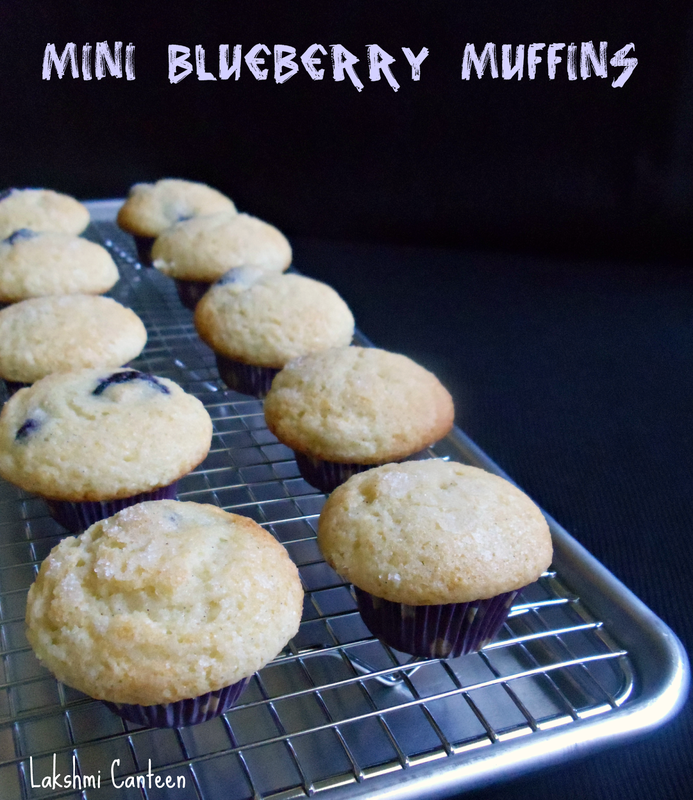 Do try making these muffins as the berries are in season. Trust me, nothing like a fresh, warm homemade muffin. I hope you enjoy as much as I do! *Use any flavorless oil of your choice like canola, vegetable etc. Set out the milk and egg for half an hour so that it comes to room temperature. Wash the blueberries and pat it dry using a kitchen towel. Now take the 'dry ingredients' in a bowl - flour, salt and baking powder. Give it a mix and set it aside until required. 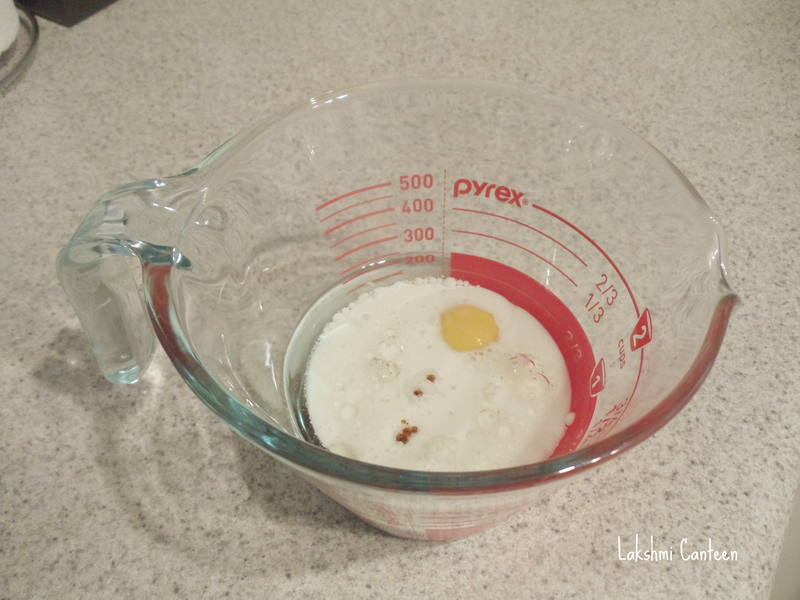 Then take a measuring cup (preferably 2 cup or 1 cup capacity). All the 'wet ingredients' goes into this cup. Firstly, add in the oil. Then break in the egg, followed by addition of the milk until it reaches the 1 cup mark (a little more than 1/3 cup of milk). Finally add in the vanilla extract (I added vanilla bean paste for that extra flavor). Now take a large mixing bowl. 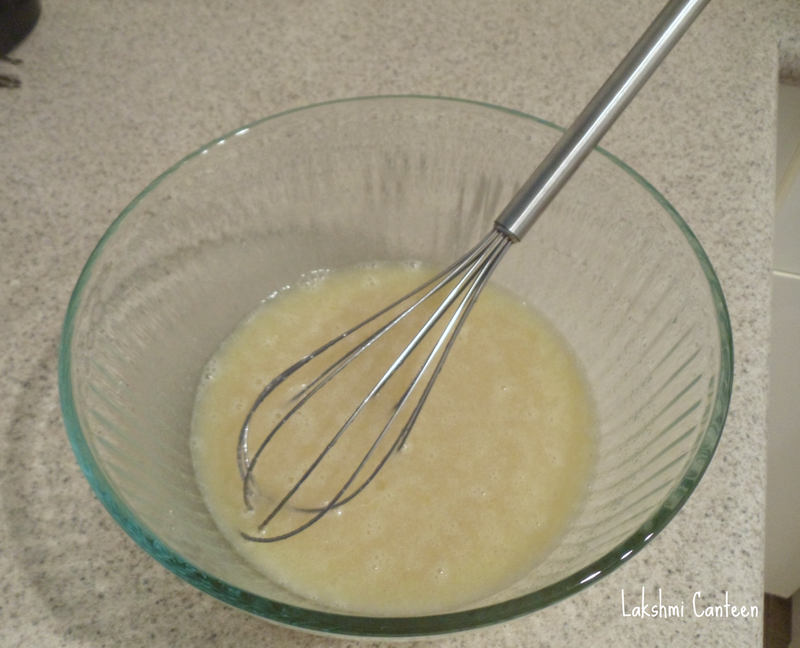 Add sugar and the 'wet ingredients' mixture and whisk it until combined. Now add in the 'dry ingredients' leaving 2-3 Tbsp of the flour mixture. 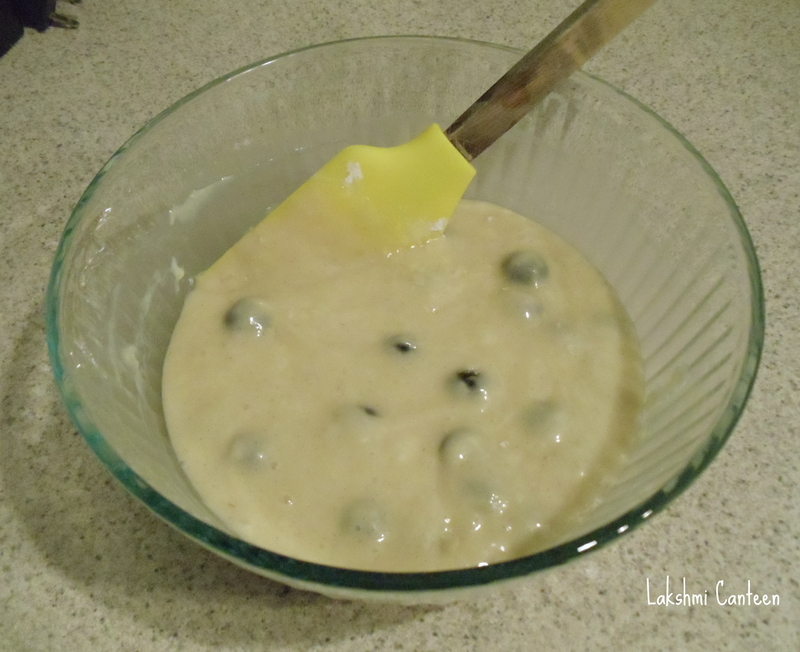 Add the blueberries in the 2-3 Tbsp of flour mixture and mix in until it gets coated with flour (this step helps in preventing the blueberries from sinking to the bottom of the muffin). Now mix in the dry and wet ingredients until it comes together. 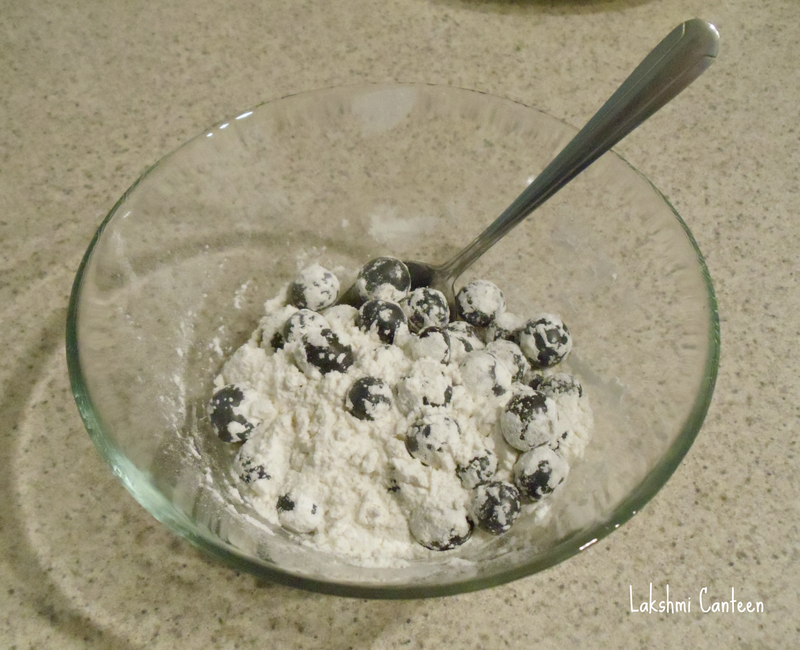 Then add in the blueberries along with the little flour and fold in gently until you don't see any flour. Don't over mix the batter as it will result in tough muffins. Now preheat the oven to 400F (200c). 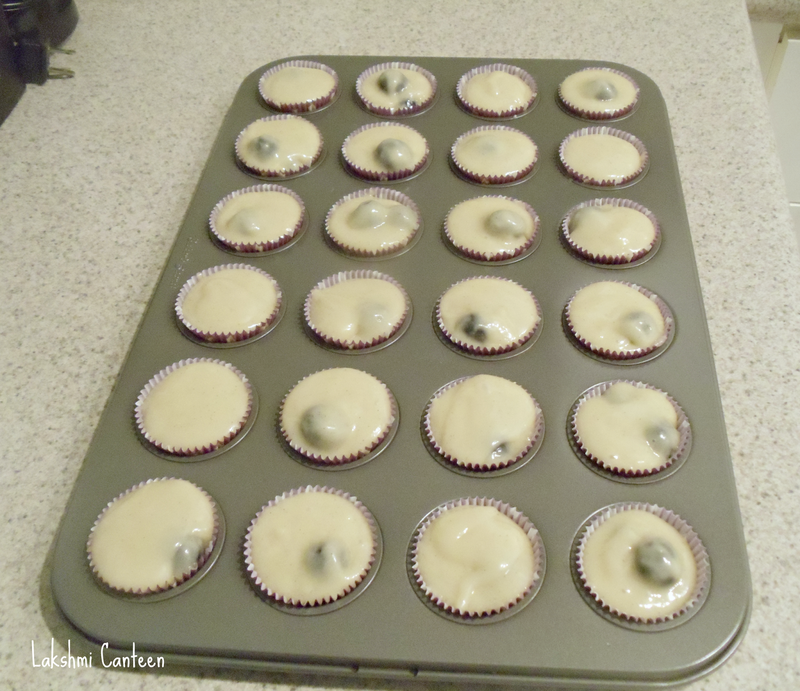 Then line the mini cupcake pan with the liners. Add the batter in each mould. Then top it off with little sugar on top. The sugar makes the top crunchy, once baked. Then bake the muffin in a preheated oven until the tooth pick inserted in the centre of the muffin, comes out clean. My muffins took 12 minutes. Leave the muffins in the pan for 2-3 minutes and then transfer it to cool on a cooling rack. 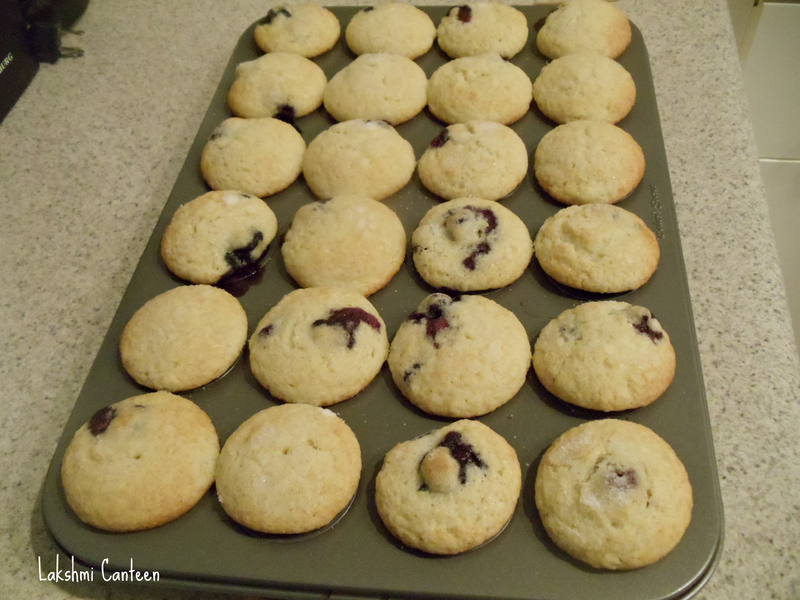 Mini Blueberry Muffins are ready! 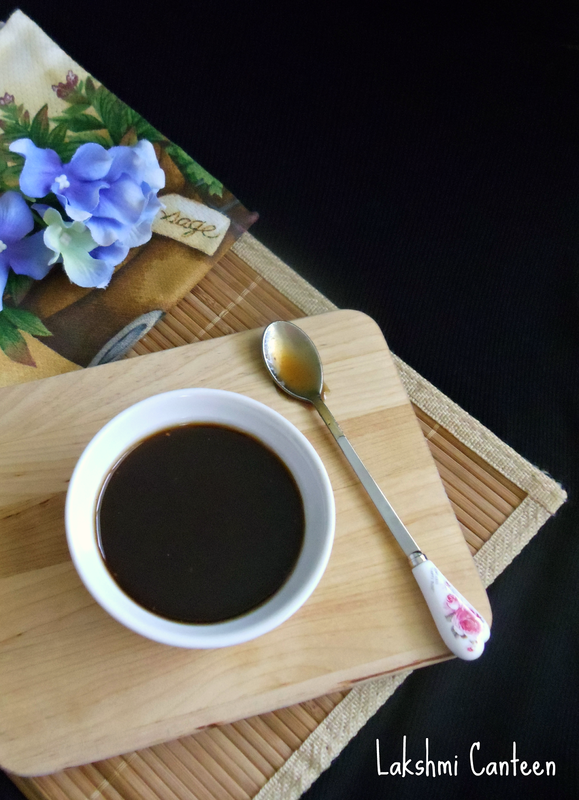 Serve it warm or at room temperature. Above measurement makes 24 mini muffins. 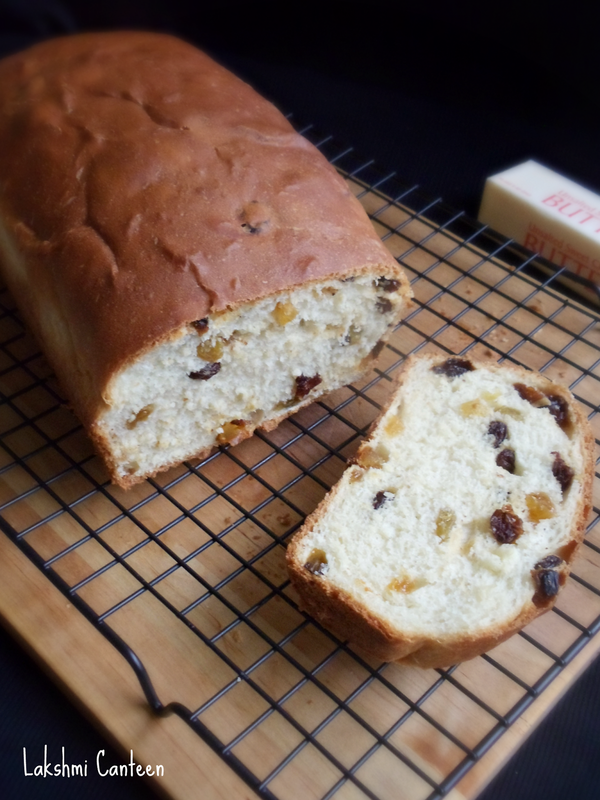 Old Fashioned Raisin Bread is one of my favorite bread. 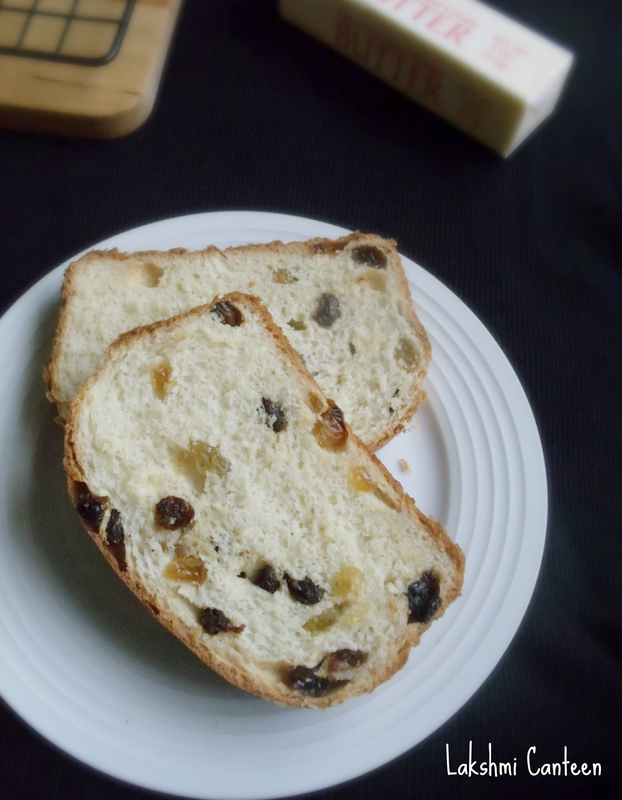 I love raisins and got introduced to raisin bread at Mancini's Bakery in Pittsburgh (They sell 'Paska', which is a sweet bread with raisins). We would buy once in a month and I would finish it off within a day or two all by myself. But then we moved out from Pittsburgh and I couldn't find anything like that in Atlanta. Then my husband encouraged me to bake my own bread. Once I started making it, we have stopped buying bread from the stores. Nothing like eating freshly baked bread. The whole process of making it is so therapeutic to me. Note: # Make sure your yeast has not expired. 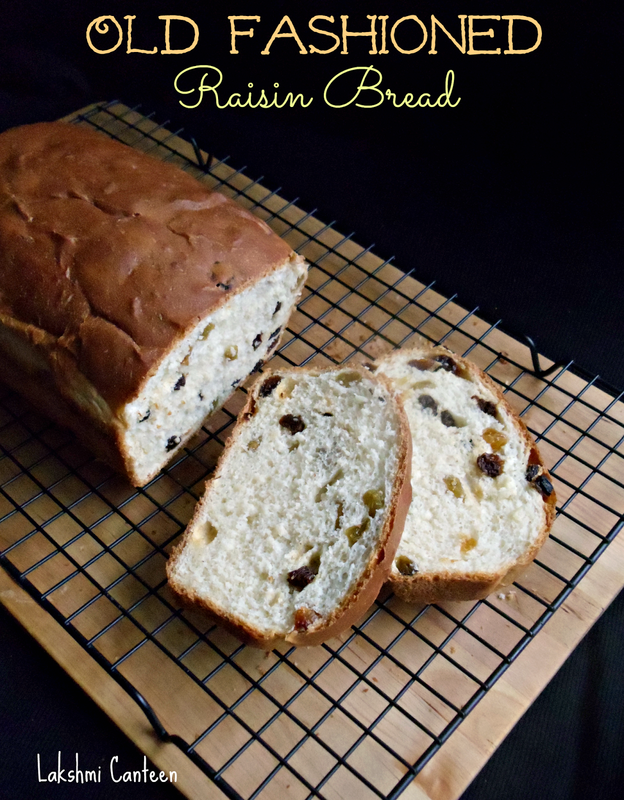 #You can add 3/4 cup each of the raisins (the original recipe called for total 1 1/2 cups of raisins but I was happy with 1 cup of total raisins). 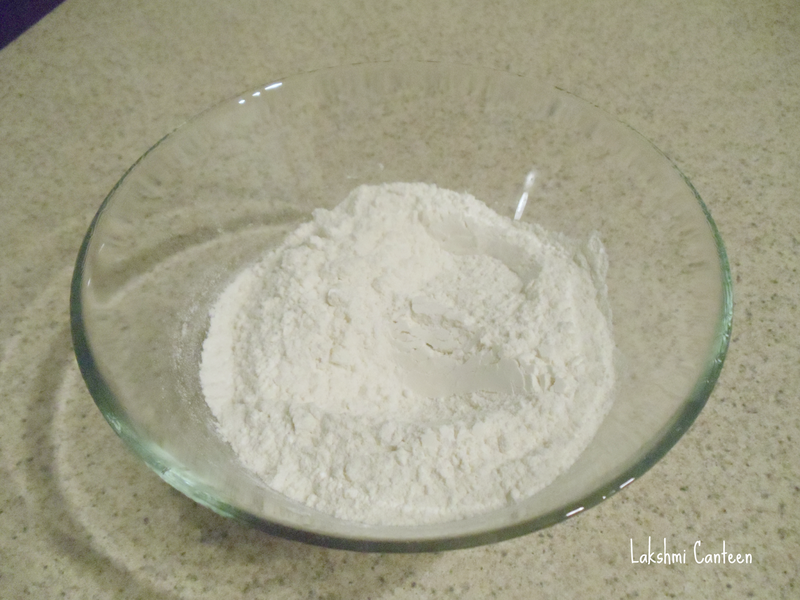 #If you can't find bread flour, substitute it with All purpose flour (maida). 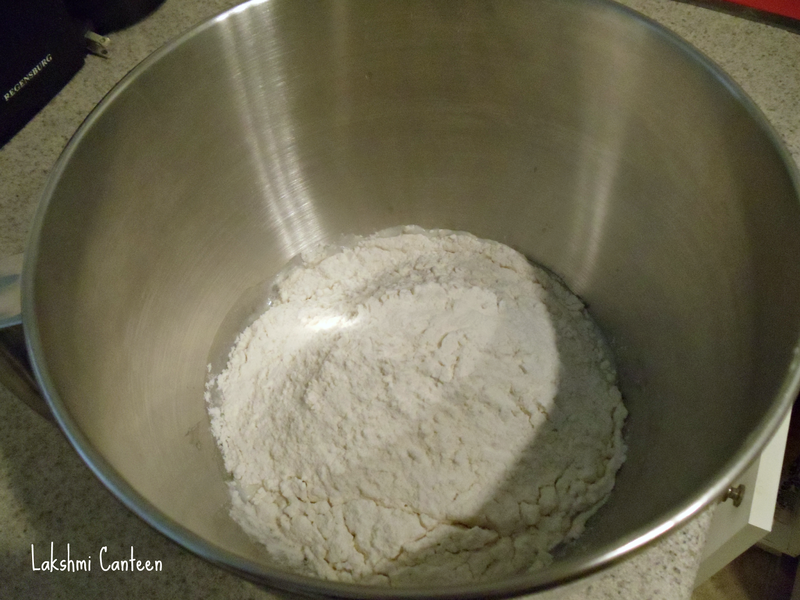 #I use a stand mixer for kneading my dough. It makes life lot easier. 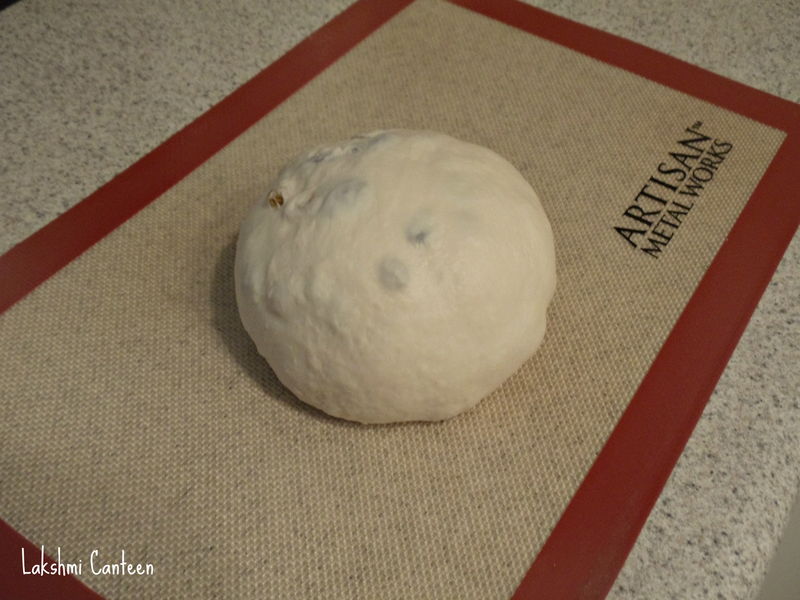 If you don't have one, then make sure you knead the dough for 10- 15 minutes. Kneading helps in the formation of gluten. 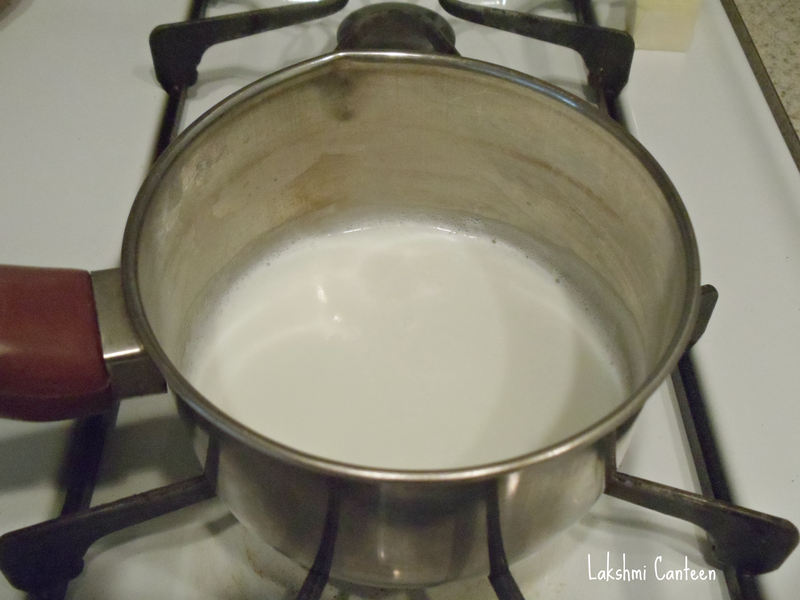 Heat the milk up to boiling point and then cool it completely. Next in a big bowl, add in the water, yeast and room temperature milk. Mix and set it aside. In another bowl add flour, sugar, salt. 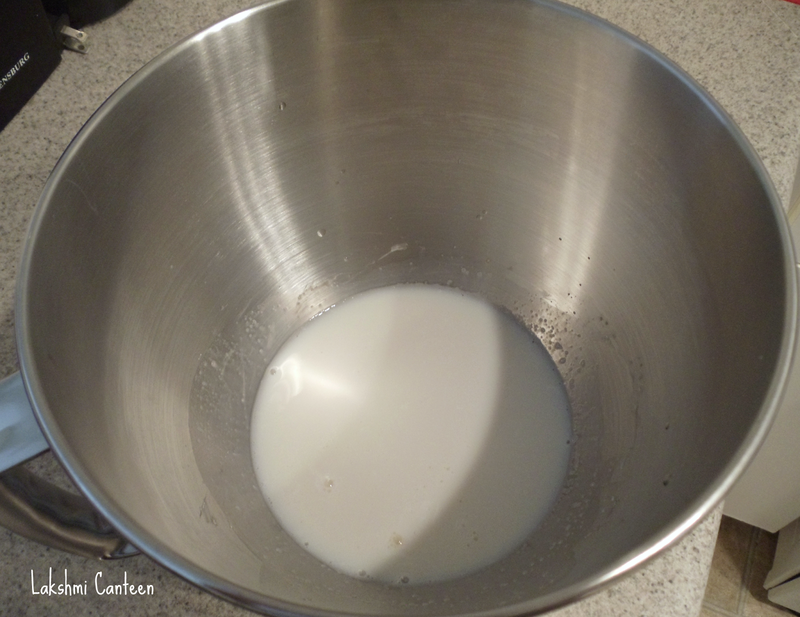 Mix well and add it to the bowl containing milk mixture. 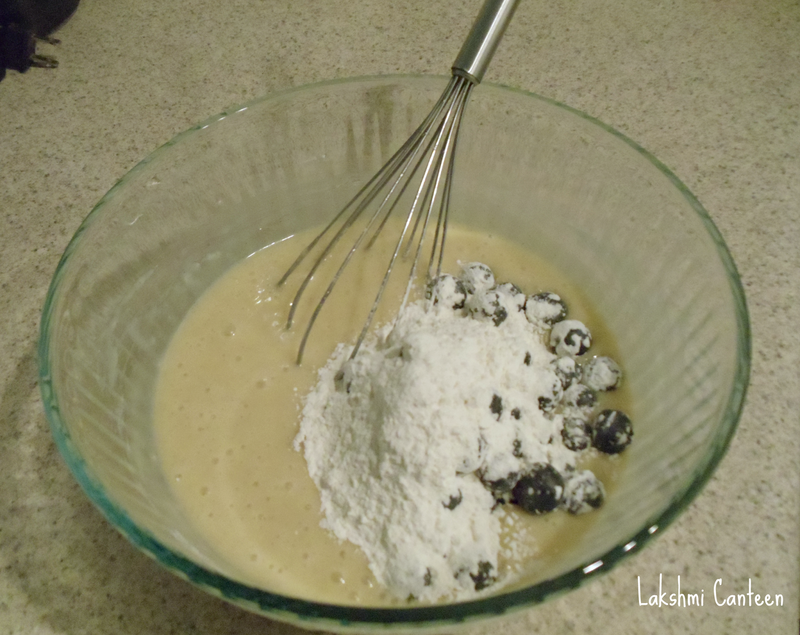 Start mixing it in a stand mixer attached with a dough hook or use a wooden spoon. Once everything comes together, add in the softened butter and knead it for a good 7-8 minutes in a stand mixer or 10- 15 minutes using hands. 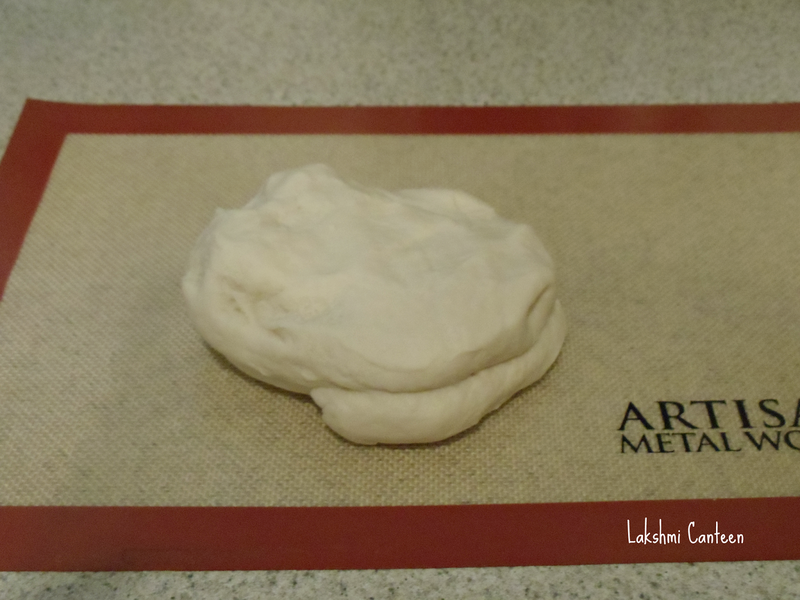 The final dough should be soft, non sticky and elastic. Once done, take the dough on a clean counter. Then spread it out a little bit using your hands. 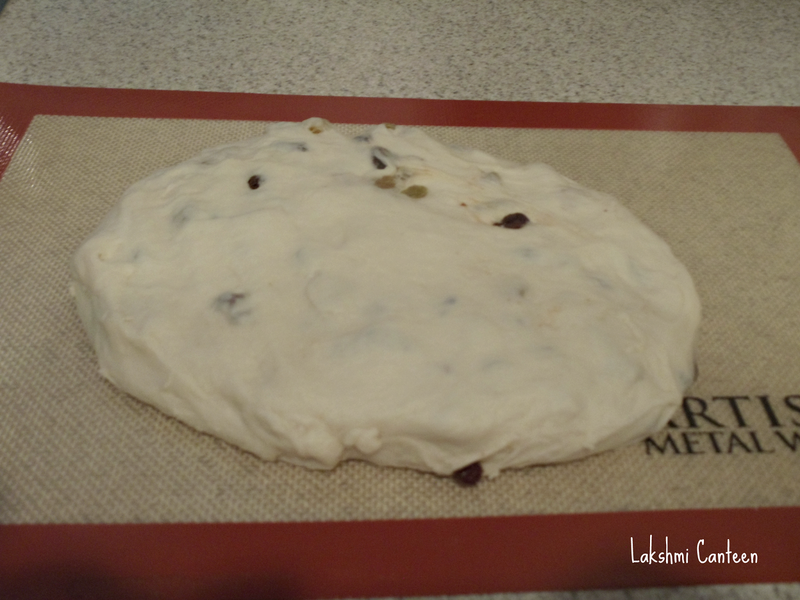 Then add in the raisins as shown below. 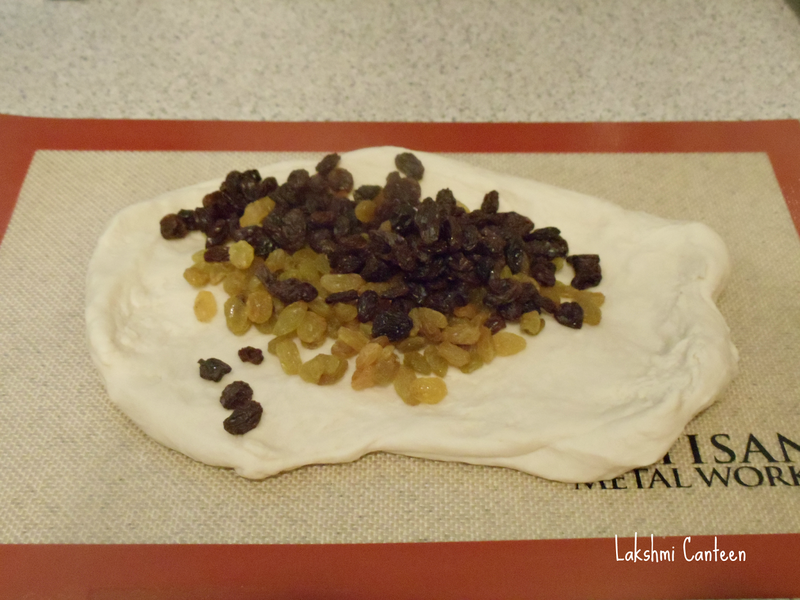 Now gently mix in the raisins so that it gets distributed evenly throughout and form a ball as shown below. 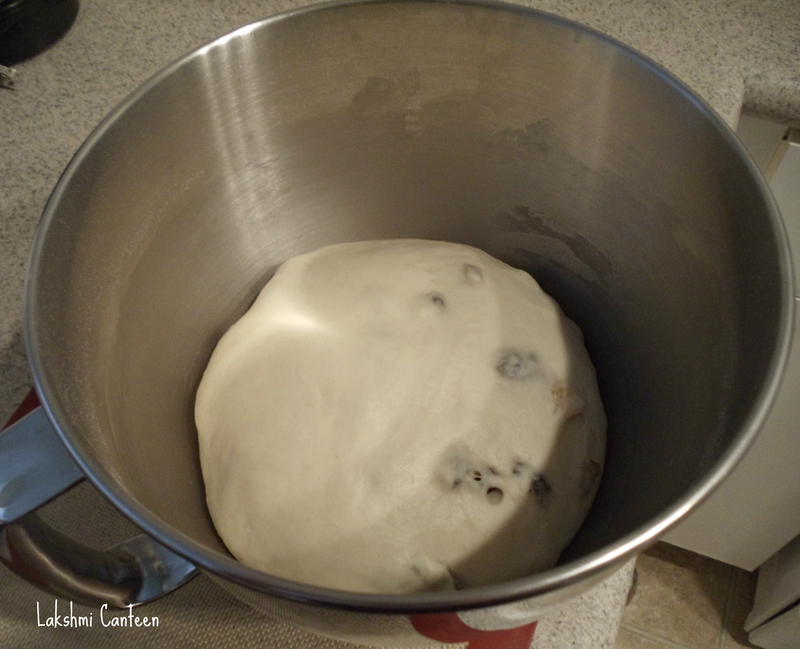 Now place this dough in a greased bowl. Cover it tightly and let it rest in a warm place for an hour or so, until it double in its size. Once it doubles, take it out gently on the clean counter and punch out the gas gently. 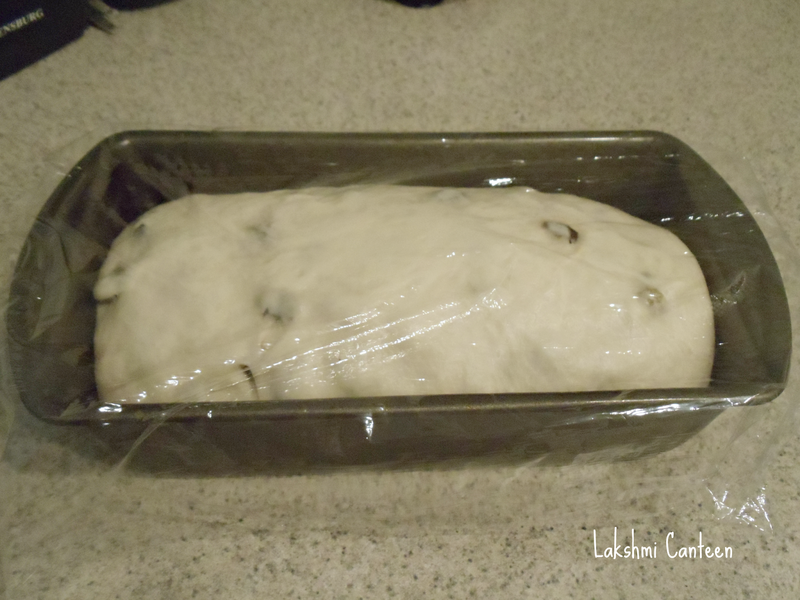 Then roll it like a jelly roll to form a loaf shape. Place this in a well greased 9x5 loaf pan. 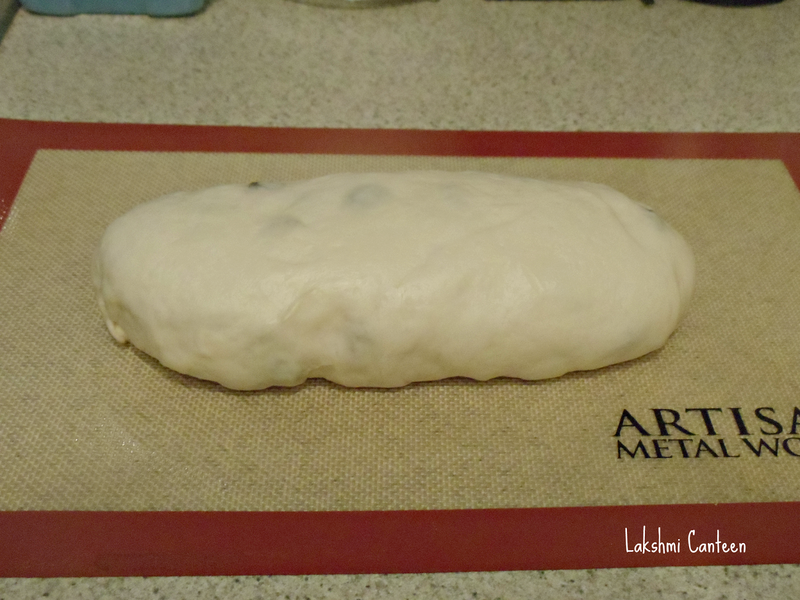 Close it with a plastic wrap and allow it to rise until the dough rises an inch above the pan (around 30 minutes). Then bake it in an oven which is preheated to 350F (180c) until an internal temperature of the loaf reads 2ooF (or a light tap on the loaf sounds hollow). It takes around 40- 45 minutes. Once done remove from the oven. 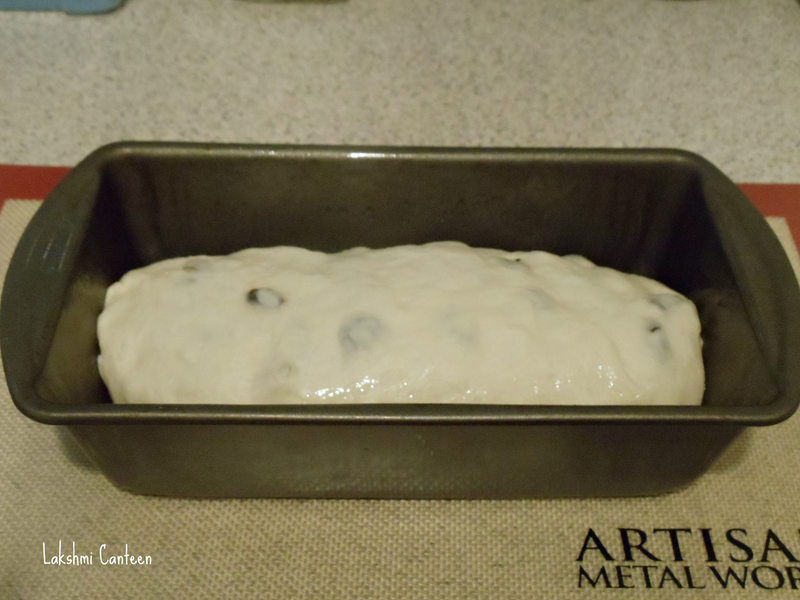 After 2-3 minutes, loosen the edges and remove the loaf and let it cool completely on a wire rack before cutting. 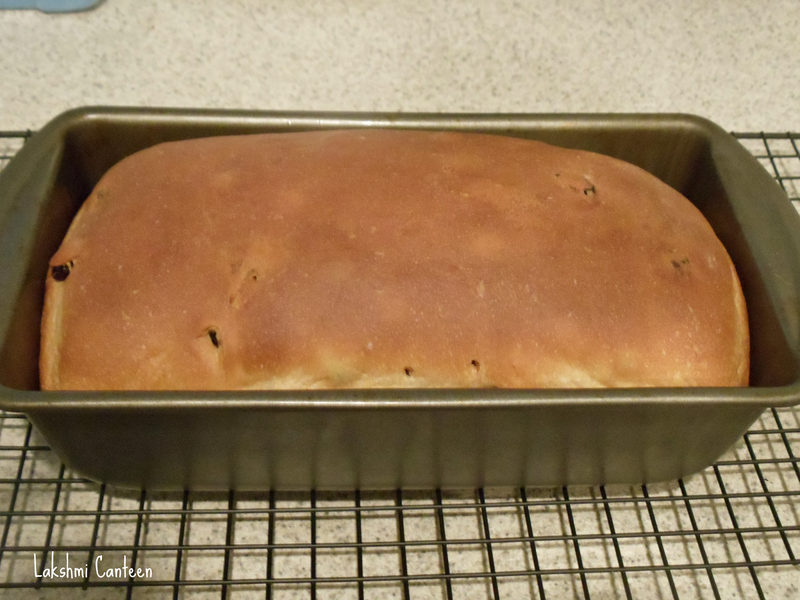 Old Fashioned Raisin Bread is ready! 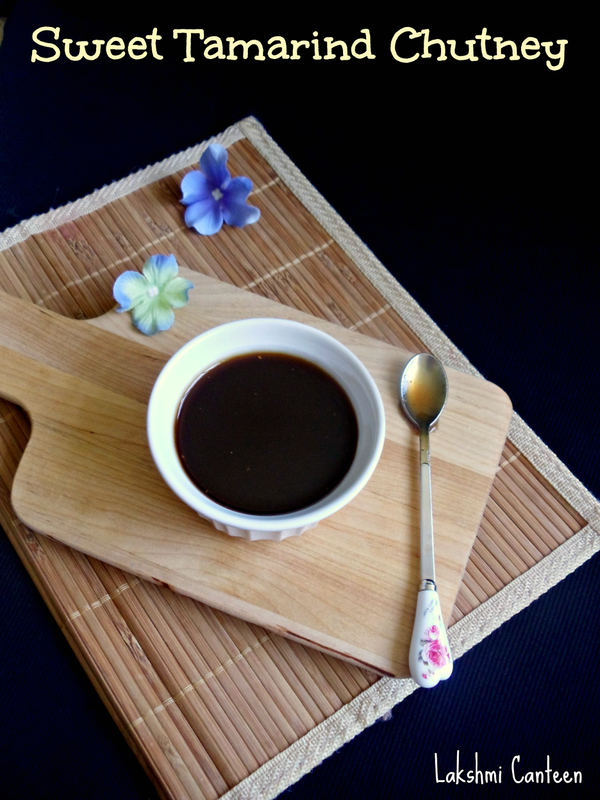 Serve it along with tea or coffee. Above measurement makes one loaf which can serve 3-4 people. A Chaat is not complete without a drizzle of sweet chutney. We love chaat and make it once a week. Hence I always have green chutney and sweet tamarind chutney in my freezer. I have been making this chutney since many years. It is so easy to make and they keep well for a long time. Do try making this chutney and enjoy it by drizzling generously on your chaat. Take a cup of water in a pot and heat it. 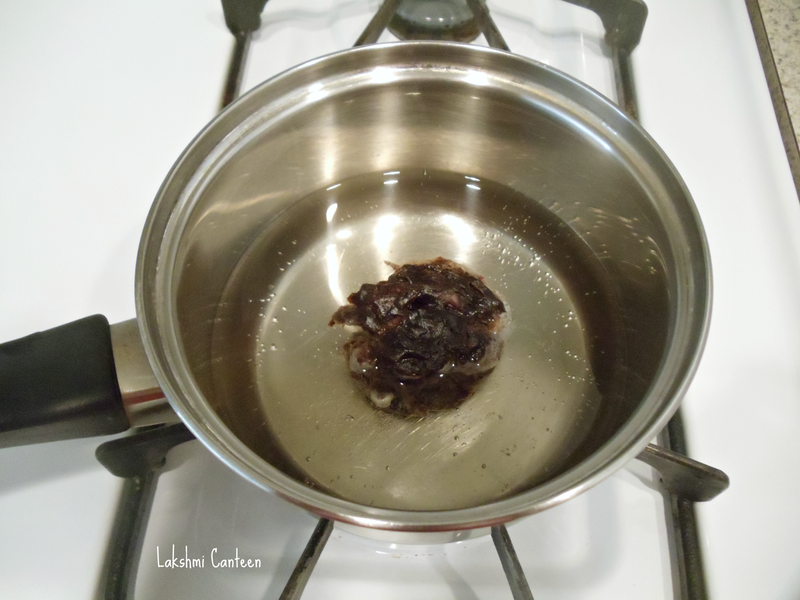 Once hot, turn off the heat and drop in the tamarind. Let it sit for 15- 20 minutes. When it is cool to the touch, mash the tamarind with your hands. Then transfer it into a blender and blend it until smooth. Then strain the mixture into the same pot and discard the fibres. Now start heating the tamarind pulp. Then add in the powdered jaggery. Let it boil. Once the jaggery is melted, add in the red chilli powder, roasted cumin powder and salt. Mix well. 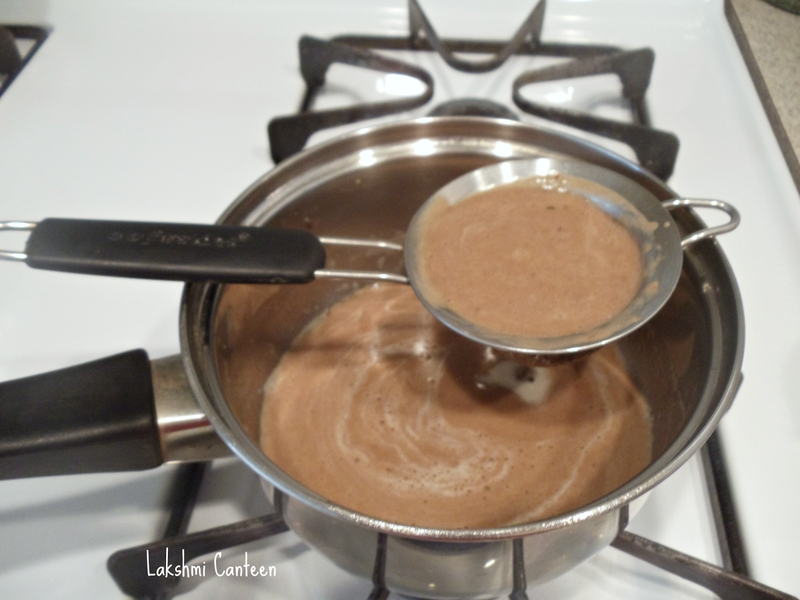 Allow the mixture to boil on a medium flame until it thickens slightly (10- 15 minutes). Once it thickens, turn off the heat. Allow it to cool completely. Remember that the mixture thickens as it cools. 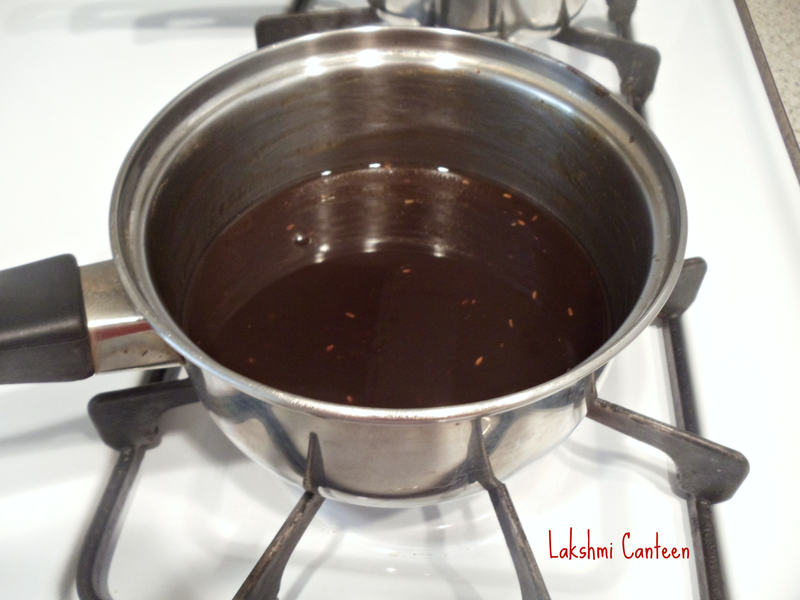 Sweet Tamarind Chutney is ready! Transfer the chutney to a clean glass container and store in the refrigerator. It stays good for a month or two. If you want to store it for a longer time then freeze them in ice cube trays and then transfer it into a resealable bag. Above measurement makes one cup of chutney. Serving Suggestion: You can top it on any chaat like masala puri, sev puri, dahi sev puri, papdi chaat, bhel puri etc. It makes a good accompaniment to samosa, dhokla etc. 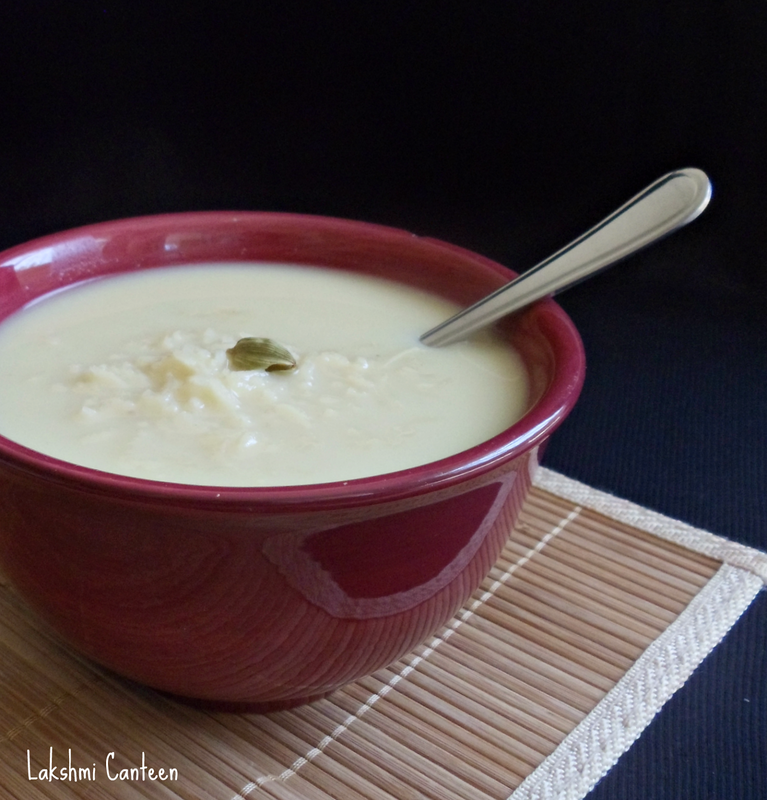 Rice Payasam is a popular sweet dish in South India. South Indian people love rice in any form. They love to have rice for breakfast, lunch and dinner. 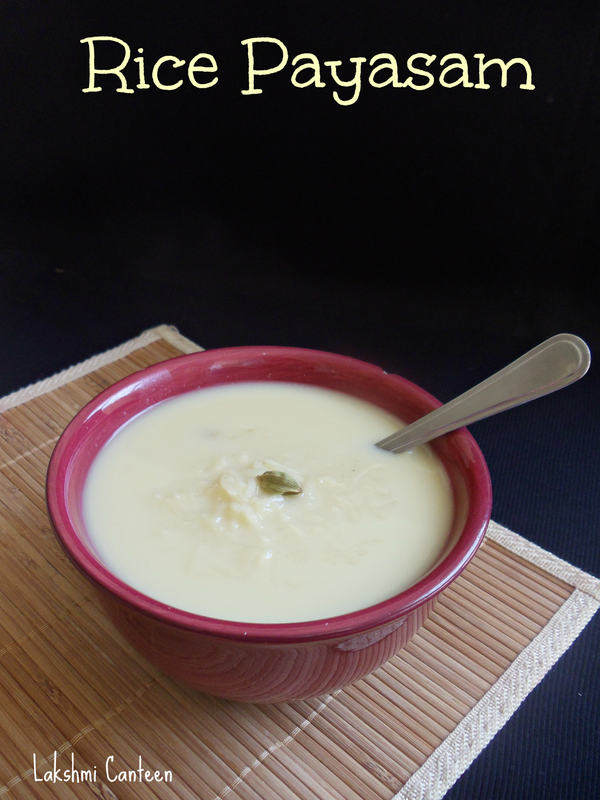 Rice Payasam (kheer) is a popular sweet dish made during festivals, get togethers, marriages etc. 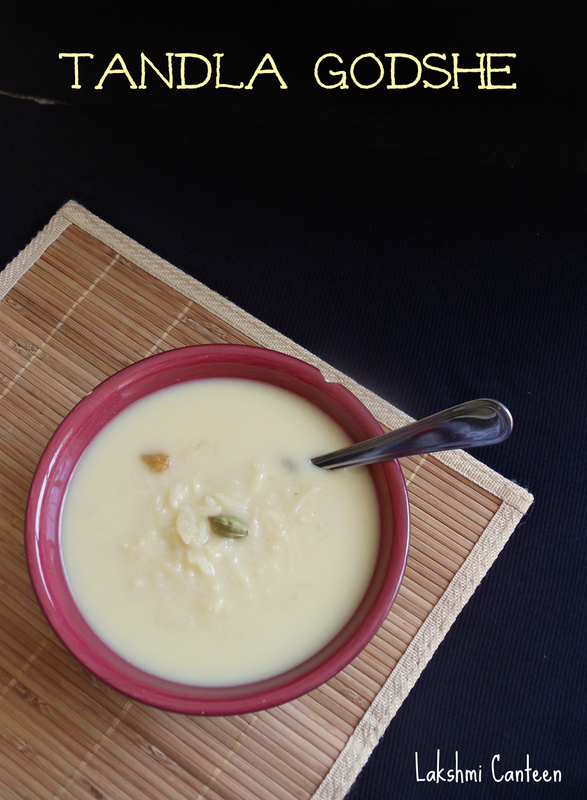 Kheer can be made by cooking rice in milk and then sweetened it with sugar and finally flavored with cardamom or it can be made the way I have shown today. The cooked rice is sweetened with jaggery and then enriched with coconut milk (or plain milk) and cardamom. Both ways it turns out good. Do try making this and I hope you enjoy it. *I have used canned coconut milk. 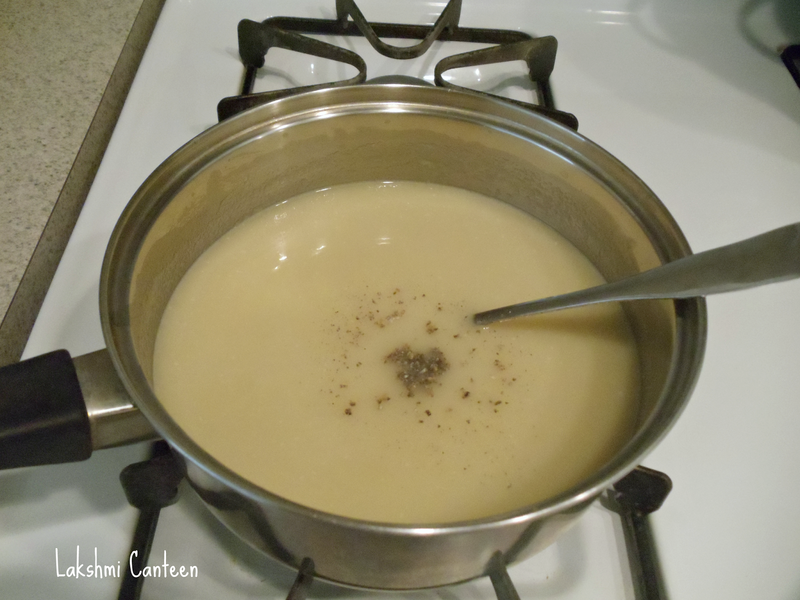 It works well but for best results, you can use freshly extracted coconut milk. You can check out the method of extraction here. You can use any white rice. 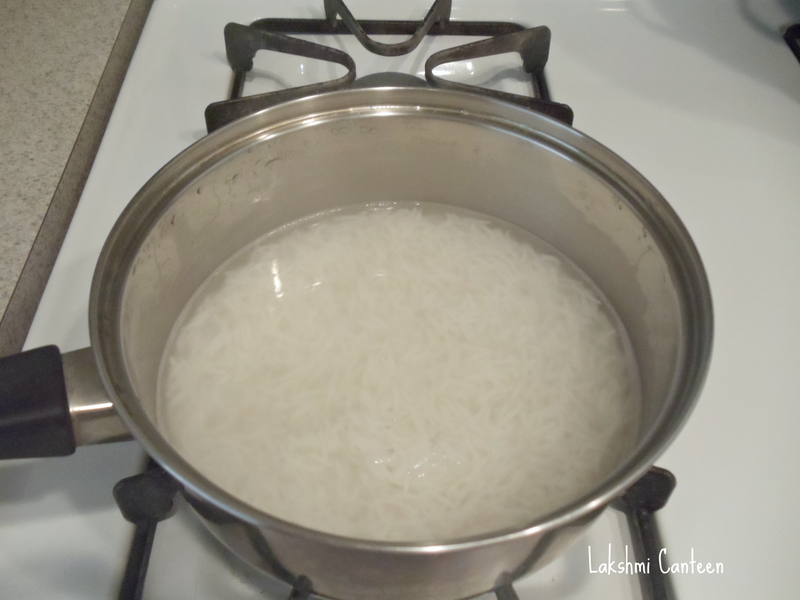 Wash the rice 2-3 times and put it in a cooking pot. Now add 2 1/4 cups of water . Start heating it. 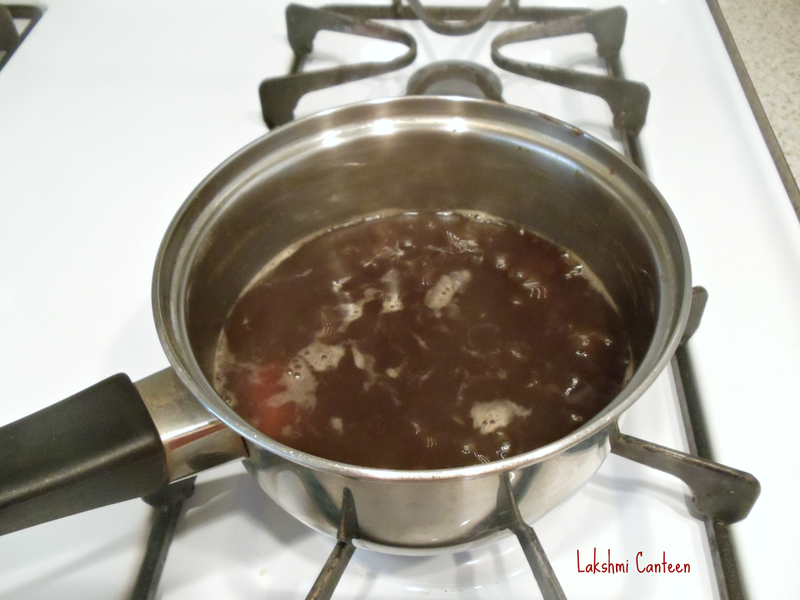 When it comes to a boil, continue heating for a minute and then close the lid. Turn off the heat and let it sit for 15 minutes. 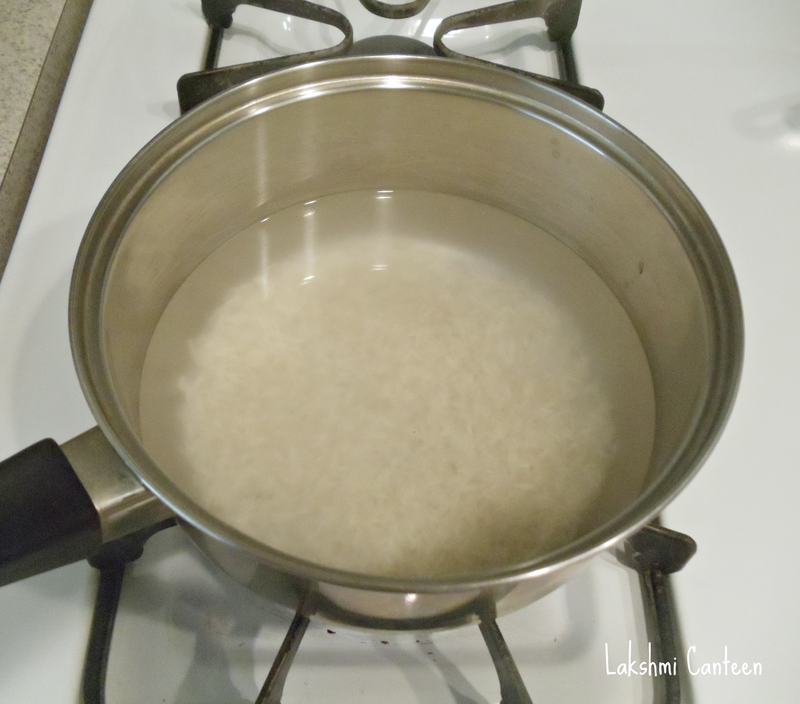 After 15- 20 minutes, the rice will be cooked and most of the water will be absorbed. Now start heating the rice mixture. To this add raisins and powdered jaggery. 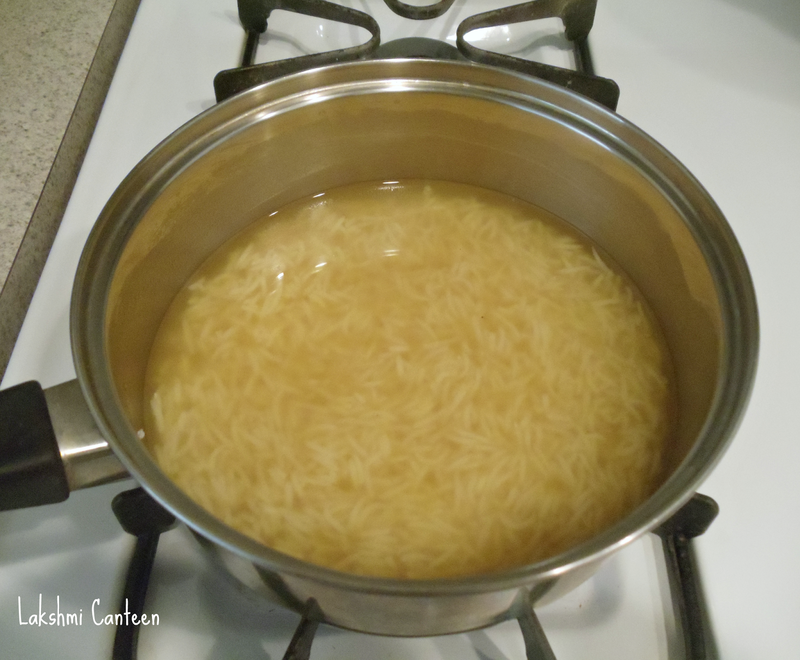 Once it comes to a boil, heat it on a medium flame for 3-4 minutes. Then turn off the heat. Finally add in the coconut milk and cardamom powder. Serve it hot or warm. Above measurement serves 3-4 people. Note: The Payasam thickens as it cools. If it becomes too thick you can always add little water or milk to get desired consistency. The color of the payasam depends on the color of the jaggery.